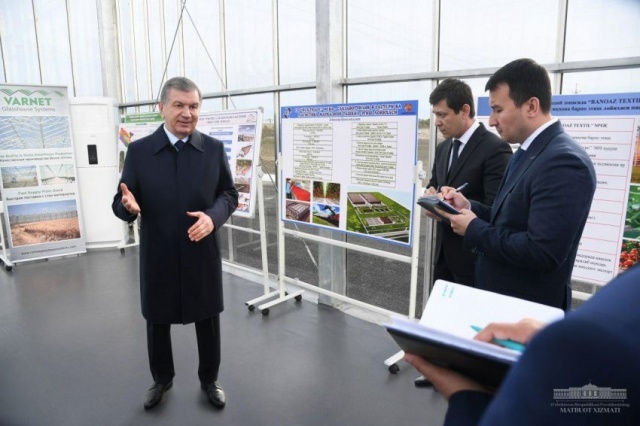 President Shavkat Mirziyoyev visited an innovative greenhouse being built in Bukhara district by the foreign enterprise “Bukhoro Varnet”, the Press Service of the President of the Republic of Uzbekistan reports. In accordance with the 10 July 2018 resolution of the head of our state, the free economic zone Bukhoro-Agro was created within five districts of Bukhara region. It provides for the cultivation of export-oriented agricultural products through the creation of hydroponic greenhouses, the creation of new jobs and growth in incomes of the population. To date, 3,000 hectares of land has been allocated for the free economic zone. This year it is planned to implement 98 projects on 598 hectares. In particular, energy-efficient greenhouses, environmentally friendly packing and packaging goods will be organized, over 4.3 thousand jobs are to be created. It is intended that products worth $ 64 million a year will be exported to neighboring countries. In particular, the project of Foreign Enterprise “Bukhoro Varnet” with the participation of Turkish investments provides for the construction of modern glass greenhouses on an area of 115 hectares. The advantage of such greenhouses is that the glass panels are durable and allow through up to 97 percent of the sun rays. It is expected that from 300 to 560 tons of tomatoes will be grown on one hectare of such greenhouses. Work has begun on the development of the first 30 hectares; greenhouse equipment is being imported from Turkey. The company will be commissioned in stages in 2019-2020. In addition, a presentation of a project on creating fruit and vegetable clusters, processing and delivering products to the external markets has taken place. The President noted that in Bukhara region there are many untapped lands, it is necessary to use them effectively and secure the processing of marketable goods based on foreign experience and technology. Following a conversation with senior officials and foreign investors, the head of our state voiced his instructions and recommendations. For any question related consular and visa, please Click Here!